Pictured from left: Michael S. McHale, President and CEO, Hospice of the Chesapeake, Earley Award recipient Gloria Kinsley of Bowie, Ora Lee and Bob Stoner of Severna Park and Bill and Rose Lovelace of Annapolis, recipients of the Spirit of Hospice Award. 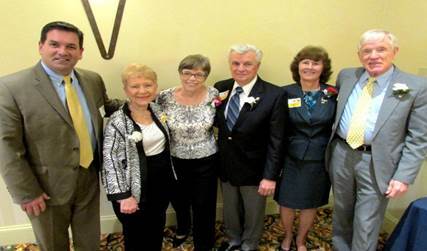 Hospice of the Chesapeake volunteers and staff recently celebrated National Volunteer Week at the nonprofit’s annual Volunteer Recognition Luncheon held April 14 at the Doubletree Hotel in Annapolis. Attended by approximately 150, among them were this year’s Spirit of Hospice Award recipients Bill and Rose Lovelace of Annapolis and Bob and Ora Lee Stoner of Severna Park. The Spirit of Hospice Award was inaugurated in 2007 to acknowledge the commitment of our non-patient care volunteers. The assistance they provide in our various departments is vital to carrying out the mission at Hospice of the Chesapeake. Gloria Kinsley of Bowie received the 2013 Joseph P. and Elizabeth Earley Award for her dedication to patient care. The Earley Award honors exemplary and extraordinary care provided to Hospice of the Chesapeake’s patients.